The first Sunday of the 2018 NFL regular season is in the books and with it came some memorable performances on both sides of the ball. 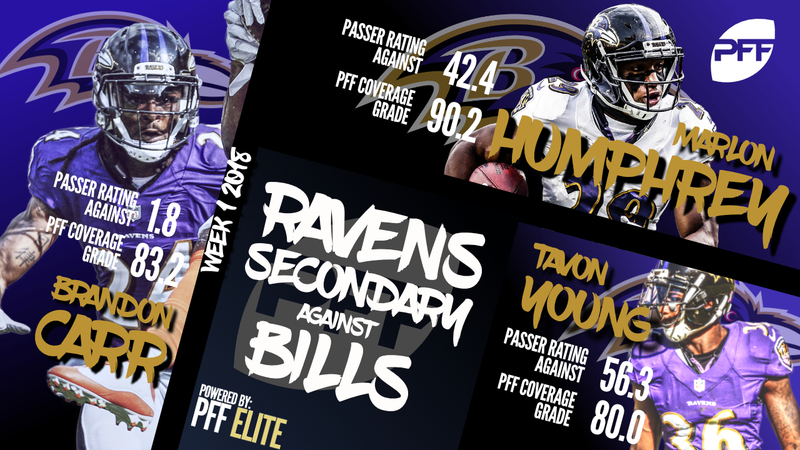 Following every Sunday this season, we at Pro Football Focus will scour our data from our team of over 500 analysts who grade every player on every play of every game and point out the most notable statistics from our wealth of data. During our grading of every player on every play, PFF’s grading generates a bevy of advanced statistics found within our Premium Stats 2.0 platform, available with a PFF Elite subscription. Below are 20 signature stats to know from Week 1 of the 2018 NFL season. Each of these stats comes to you after our grading and subsequent All-22 review processes are in the books. Richardson accumulated a whopping seven pressures on his 27 pass-rushing snaps from the defensive interior, recording a massive 13.0 pass-rush productivity rating that topped all interior defensive linemen who rushed the passer at least 20 times on Sunday. Carr was targeted seven times in coverage against the Bills, allowing just two receptions for 24 yards including just two yards after the catch allowed. He added in an interception and allowed just 0.13 yards per snap in coverage. Fitzpatrick was lights out against the Saints, completing 21-of-28 passes despite seeing two dropped balls and another batted at the line of scrimmage for an 85.2 percent adjusted completion percentage. His 14.9 yards per attempt are clear and away the highest of the day on Sunday and he accounted for 17 first downs on his passes. Surgical from a clean pocket, Rodgers completed 17-of-22 passes for 251 yards and two touchdowns when kept clean from pressure. His 144.3 passer rating when not under duress finished second behind only Fitzpatrick. Welcome back, Mr. Yanda! On 36 snaps in pass protection, Yanda did not allow a single pressure and recorded a solid 87.9 pass-blocking grade. In his debut performance with his new team, Mack consistently won his pass-rushing snaps en route to an 87.5 pass-rushing grade and six total QB pressures on 32 snaps. Despite the loss, the rookie linebacker put forth a strong effort, tallying five defensive stops for an offensive failure, forcing a fumble and allowing just a 67.9 passer rating in coverage against Minnesota. Grant was as sure-handed as it gets on Sunday, hauling in 8-of-8 catchable targets thrown his way. While he may have generated just 1.37 yards per route run, his safe hands could be positive signs of things to come. Cook was seemingly back to his pre-injury form in his first game since an ACL injury last season. He forced or avoided tackles at a high rate, making 10 defenders miss on his 22 total touches. His 10 total tackles avoided were the tops in the league on Sunday. 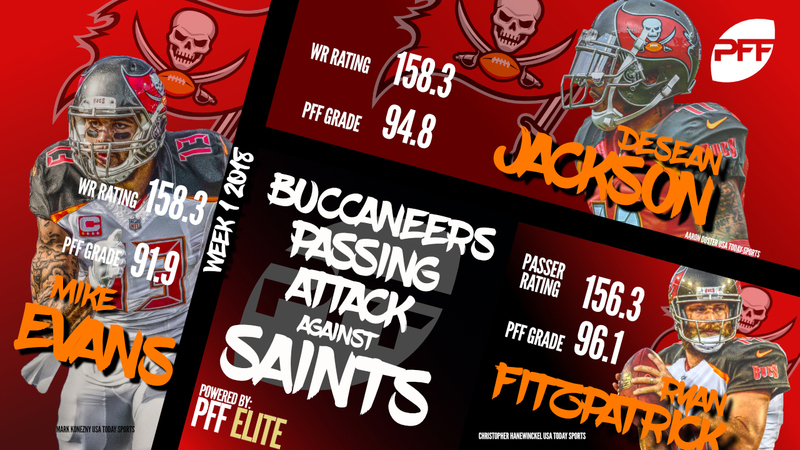 Jackson and Evans dominated in this contest against the Saints, benefiting from the great play from Fitzpatrick. Jackson recorded an absolutely astounding 11.23 yards per route run mark while Evans’ 5.07 yards per route run was third best among receivers this week. Barkley was bottled up for most of the afternoon by a stout Jaguars defense but did have his moments. He broke five tackles on the day and averaged a whopping 5.28 yards after contact per rushing attempt, the highest on the day among backs with at least 15 carries. Thomas joins fellow NFC South receivers Mike Evans and Julio Jones in leading the league’s receivers by accounting for seven first down on receptions this weekend. Thomas led those three with 60 yards after the catch compared to 44 for Evans and 32 for Jones. Ogunjobi was stout in run defense for the Browns against Pittsburgh despite sometimes awful conditions. The second-year pro recorded three run-stops without missing a tackle and saw an 84.3 run-defense grade. Against Houston, Flowers lit up the stat sheet, securing seven total pressures on 30 pass-rushing snaps including two sacks, one hit and four additional hurries. Equally impressive in run defense, Flowers also recorded three stops against the run, tying for the league lead among edge defenders. The game may have ended without a victor but Williams dominated while filling the void left by Ryan Shazier in the linebacker corps for Pittsburgh. The former Florida State Seminole recorded a ridiculous seven stops in run defense and saw a 23.3 percent run-stop percentage to lead all off-ball linebackers in Week 1. Despite a drop, Kittle was heavily targeted against Minnesota, hauling in 5-of-9 passes thrown his way. He led the league’s tight ends with 66 yards after the catch and while he was held out of the end zone, accounted for four first downs on his receptions. Robinson logged 37 reps in pass protection without allowing a single pressure. His 81.2 pass-blocking grade is a marked improvement from his rookie season and a top-10 mark among tackles this week. Flacco’s adjusted completion percentage of 90.6 is the league’s highest mark among signal-callers as he completed 25-of-34 attempts with one throw away, another batted at the line of scrimmage and four dropped balls. He may have allowed a touchdown into his coverage but the fourth overall pick still recorded two interceptions and a 66.7 passer rating when targeted. All told, Ward was targeted 10 times by Ben Roethlisberger, allowed just six receptions for 50 yards (just 16 after the catch) and recorded another pass breakup. Miller reminded the world just how impactful he can be in a game, registering five total pressures including three sacks while also forcing two fumbles all without missing a single tackle. His 94.6 run-defense grade was the highest among all edge defenders in Week 1.